Yesterday, while out running, I noticed 2 cars making U Turns. I had to assess what was going on as I was crossing the road where they were making the turn. Should I go or wait until I totally knew what they were doing? When I mentioned to my husband that there must be a lesson there, he also indicated that he read a news headline regarding someone making a U turn. Perhaps you have made U Turns in your life – mostly while driving. At first, you may be upset with yourself as you interpret it as having gone the wrong way. Why is our first reaction that we were wrong? We were doing the best we could – perhaps following the GPS or the map. We possibly were distracted by noise, others talking, horns, outer disturbances, inner upset – so many ways to lose our focus causing us to miss our turn. By going the way you were, you may have noticed something that you would not have otherwise seen. A gorgeous sunrise or sunset. Meeting a friend you had not seen in a while. It was meant to be to have been going the way you were – even if you had to then turn around. In life, we may feel that the direction we are going in does not feel right. You sense that you need to make a revision. Is it time for you to make a U Turn? It could be the best thing that happens! A new found sense of adventure, aliveness and purpose. Sometimes you cannot explain it. You just know. You have that feeling in your gut that is motivating you to make that turn. 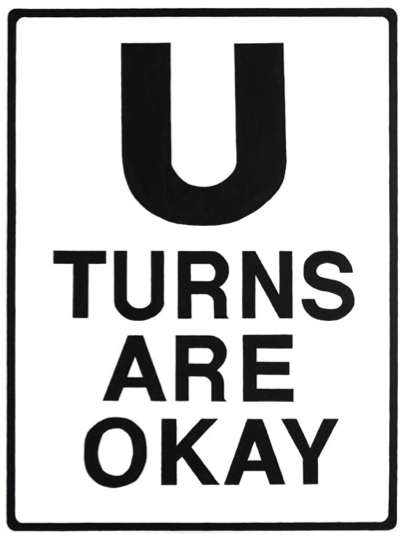 Making a U Turn is similar to just changing your mind about something. Being a Libra, my nature is to look at all sides and all angles. I then can make a better decision. However, sometimes I change my mind. I get a feeling that won’t go away. So I listen – most of the time. It is a course correction. A shift. A re-evaluation of priorities. A preference. A desire. Life is full of detours, U Turns, and side streets. That’s where most of the excitement is. And, in most cases, where you will most likely find your success, your truth, your purpose. I appreciate and give thanks for the adventures that U Turns bring to my life. Have you made a U Turn today?